NTR’s bash upsets Rajamouli’s diet! Ace director S.S. Rajamouli seems to be taking care of his diet in order to become more fit. Perhaps, this is to get himself into better shape for the tough ‘Baahubali’ shoot that is all set to begin soon. Rajamouli is generally known for his perseverance, but Young Tiger NTR seems to have thrown a spanner into his plans. As many of you know, NTR celebrated his birthday yesterday. The actor invited his close friends for a lavish party and as can be expected, the choices delicacies were served there. 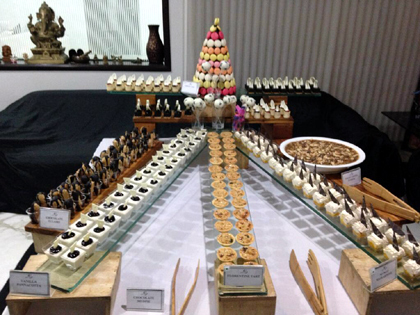 Rajamouli put up this photo on his twitter account, showing some of the desserts served at the party. “Have been dieting strictly for the past week. All Gone for toss at tarak’s birthday bash”, he tweeted.